How has the School of Cinematic Arts changed your view of your discipline? When I arrived at USC for the SCA Summer Program, I had thought that Film and Digital Cinematography was going to focus more on the technical side of filmmaking. Quickly, I learned that cinematography is more about interpreting and understanding a story. By creating an aesthetic and establishing an emotional tone, USC taught me that cinematography, like many other disciplines in filmmaking, is about telling a compelling visual story. Story comes first. Film and Digital Cinematography is a perfect combination of the theory and the craft of cinematography. I had the opportunity to work on several USC film sets in variety of different positions. Working the different disciplines gave me a better perspective about each person’s role on the set. When I become a cinematographer, I intend to collaborate with the gaffer and the production designer with a better understanding of their roles. What advice do you have for prospective students looking at applying to your program? If filmmaking is your passion, follow it. This summer I met a collection of people with different backgrounds, who all shared one passion: filmmaking. We would stay up late at night watching a host of TV shows and movies, critiquing and learning from our differing opinions and backgrounds. It was an amazing experience to be around so many creative people. My advice would be to talk about your stories with writers, actors, and filmmakers from different generations. As a rising senior in high school, my summer at USC was a cross-generational experience where I interacted with people at different stages in their film careers. It was total immersion into filmmaking. Secondly, embrace the fact that you’ll be studying film at the best film school in the country, let alone the world. Don’t be intimidated by the naysayers who say that USC is too competitive and you won’t get in. If you’re passionate about filmmaking, there’s no better way to follow that passion than spending a summer at USC. How has the School of Cinematic Arts prepared you so far for a career in your discipline? The School of Cinematic Arts taught me a great deal about cinematography and telling stories. Whether teaching me about the basics of a sound stage or showing me how lighting and camera angles can affect a story, USC gave me the tools necessary to be an active member on any kind of set. For instance, our Film and Digital Cinematography class read a book over the summer semester that I now call my “Cinematography Bible.” I never felt overwhelmed by the amount of information I was learning each day. I was not only taught the facts, but how to implement the skills necessary to be a filmmaker. I now have footage from a variety of different formats, including Super 16mm and 35mm. At USC, I was able to shoot quality footage that I can use for a Director of Photography reel. What have been the biggest challenges for you at USC? 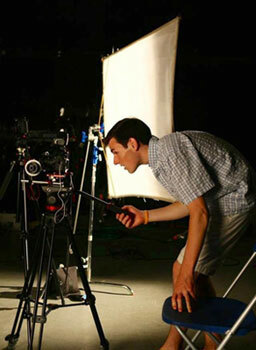 Since the Film and Digital Cinematography is condensed into a summer semester, the course is intensive and fast paced. USC offers many opportunities to get on student film sets. Since the Summer Program is fast paced, my biggest challenge was saying no to great opportunities that I wish I could have said yes to. I learned that as a filmmaker, it’s important to organize your priorities. My other challenge was overcoming any insecurity I felt about my work. All filmmakers are insecure about their work to a certain extent. Each Tuesday in cinematography, we watched and critiqued each other’s dailies from the weekend before, and I often found myself nervous about how my footage would be received, asking myself, “Did I properly expose that shot?” or “Did I double check to see if I had my focus?” USC taught me to trust my gut. I learned that if we followed the proper steps taught to us, our footage would turn out as we had intended it to. What in your past has given you inspiration or a unique point of view which you bring to USC? From a young age, I’ve struggled with a learning disability. I was diagnosed with an auditory processing disorder in kindergarten, meaning that I learn better when I see things. I became a visual learner. It evolved from drawing pictures on the front of flash cards and constantly checking out picture books from the library to watching movies. My love for watching movies soon transformed into filmmaking, leading to cinematography. While I started filmmaking at a young age, what actually gives me my unique point of view is visual learning. Filmmaking has become a creative medium where I leave behind my frustration in school and express myself by telling visual stories. It started out as replicating the Mission Impossible title sequence in my dark garage with sparklers and grew into ten-minute documentaries as a sophomore in high school. When I came to USC this summer, I found myself behind the camera on a number of my peers’ projects. This experience fueled my passion for visual storytelling more than ever, and I will be forever grateful to USC for an amazing summer.